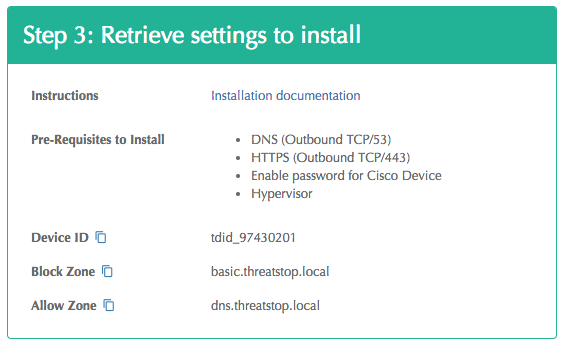 This document describes the step to configure a PAN-OS Device using the ThreatSTOP Centralized Manager (CLI version). Automated retrieval and updates of IP Defense policies from ThreatSTOP’s systems to the PAN-OS device. Automated collection and upload of log files from the PAN-OS Device to ThreatSTOP’s systems. The integration is performed by a Linux-based virtual machine provided by ThreatSTOP, named ThreatSTOP Centralized Manager (TSCM). After its initial installation, the TSCM will retrieve the list of subnets matching the policy configured via the ThreatSTOP Admin portal and update the PAN-OS firewall using the PAN-OS XML API. Optionally, the firewall can be configured to send the connection log events to the TSCM via syslog and the TSCM will package and upload log files to ThreatSTOP’s Portal, for analysis and reporting. The current version of TSCM is compatible with all PAN-OS devices running PAN-OS version 6.x, 7.x, 8.x (8.0 and 8.1 as of this writing). The Maximum Policy Size is the number of address groups (cfg.general.max-address-group) multiplied by the number of addresses in a single address group (cfg.general.max-address-per-group). PAN Article on the topic. To perform this installation, you need an account with API access on the PAN-OS firewall. During this step, you will create a device entry on the Admin Portal. You will select a device type (PAN-OS PA Series) and enter the configuration settings. A minimum configuration only requires a handful of settings but optional, advanced options are also available. Device Management IP address: This is the internal address of the device. The TSCM will communicate with the PAN device via HTTP using this IP address. 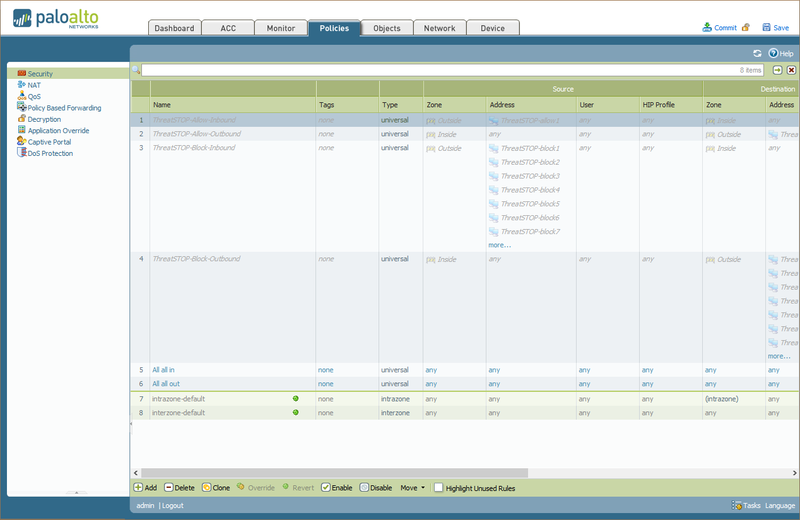 Syslog Profile: enter the name of a syslog profile to create a new profile for the TSCM. Use ‘none’ to avoid creating a new syslog profile. Trusted Zone: the list of networks for your internal (trusted) networks. If your PAN-OS configuration includes several zones, provide them as a comma-separated list. The default setting is Trusted. Untrusted Zone: the list of networks for your internal (trusted) networks. If your PAN-OS configuration includes several zones, provide them as a comma-separated list. The default setting is Untrusted. Virtual System Name: enter the name of the virtual system (vsys) as it appears at the top of the screen when viewing your vsys. This is not the entry in the Name field of the device, but has the format vsysX (where X is a number) and should appear at the top of the screen when configuring the PAN-OS device. For a single firewall instance, this would be vsys1. Number of Dynamic Lists: the number of dynamic lists ThreatSTOP may use (defaults to 9, one allow and eight block). You can adjust this setting to meet the available resources on your device. If you have custom dynamic lists already generated, you will need to drop this number to account for the number of block and allow lists you currently have setup. Send logs to ThreatSTOP? : If enabled, the TSCM will send logs received from the device to the ThreatSTOP reporting system. This is the recommended setting. When disabled, logs for this device will not be available for reporting in the Portal. 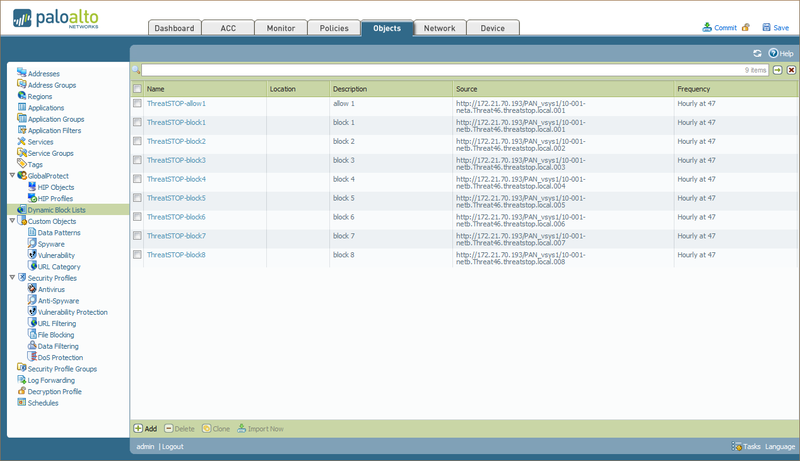 From this point on, the TSCM will retrieve policy data (IP subnets) and configure them on the PAN devices, every hour. This will configure the PAN with the settings provided above, set the syslog source IP, establish the syslog server, setup log forwarding, create the EBLs and then setup the policies. 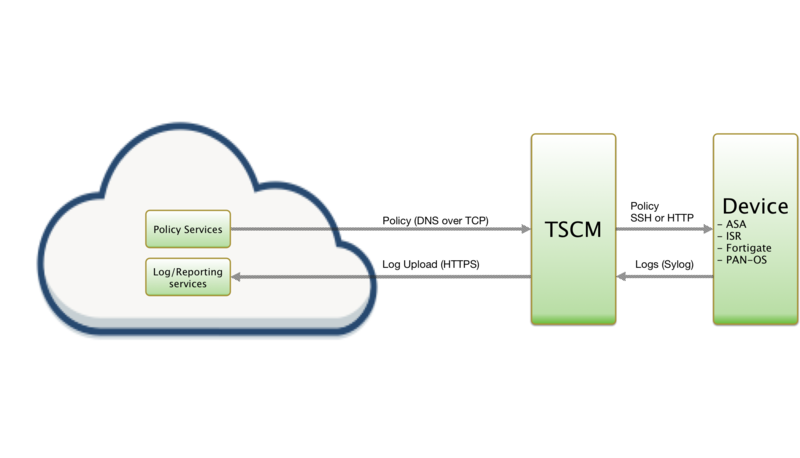 Configuration of the TSCM is now complete, but the policies uploaded to the TSCM will not be active at this point. You will need to login to the firewall and activate the policies. Note: Lists cannot be imported until they have been added to a policy rule. After adding the list to an enabled policy rule, the data for it will be imported. 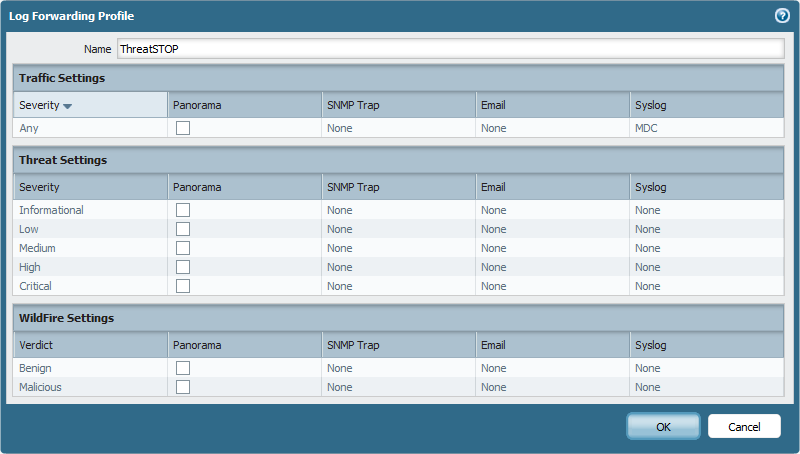 Log into your PAN device through the web management interface. Place these rules where you want them in your policy. We recommend placing them at the top. After placing the rules in your desired location select all four rules, and click Enable at the bottom of the screen. Now click Commit at the top of the screen to enact the changes. To complete the installation, you can force the import of the policy data in the EBL. Check the box next to the lists you want imported immediately. You have the option of setting up log forwarding for your policies policies using syslog and Log forwarding. This will enable the reporting features for this device on the ThreatSTOP portal. This procedure has two parts, one of ThreatSTOP and one for existing policies on the PAN. Under Objects click Log Forwarding. Click on the syslog profile configured during the setup (default ThreatSTOP). Select any of the data you want to forward and click OK. Note: A single TSCM image can manage multiple PAN-OS devices (as well as Cisco ASA, Cisco ISR and Fortigate Fortinet devices). Simply repeat the device entry creation (step 1), skip the download and VM install (step 2) and link the additional device(s) by repeating step 3. If your PAN-OS firewall is part of a High-Availability pair (Active/Active or Active/Passive), the TSCM can connect to each device to maintain the configuration. The devices must have the same set of credentials. Configure the management IP address of the backup system in the HA cluster in the ‘HA Device IP address’ field. This will remove the PANOS device and all ThreatSTOP Policy Rules, as well as the dynamic block lists and log forwarding profile. If tsadmin add fails to connect to the device, check the credentials (username, password).